Whitmarsh has earned over $1.6 million in his career with 28 titles. Was named AVP Role Model and Special Achievent awards in 2003. Awarded Best Blocker in 2002 and Rookie of the Year in 1990. 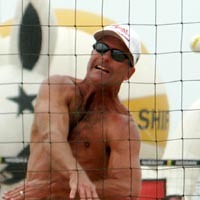 Placed first in 2000 and second in 2001 in the King of the Beach competitions in Las Vegas. Teamed with Mike Dodd to capture the Silver Medal at the 1996 Atlanta Olympic Games. Personal: Began playing volleyball in 1986 and is one of the few top 10 players who did not grow up playing the sport. Graduated from University of San Diego in 1985 with Bachelor�s Degree in Political Science and a minor in Business. Played basketball at University of San Diego and was drafted by the Portland Trailblazers of the NBA in 1984. Played briefly with the Minnesota Timberwolves. Played three years professionally in Germany. Whitmarsh is survived by his wife, Cindy, and two daughters, Jaden and Kendall.